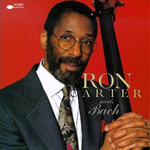 CD review: "Ron Carter Meets Bach"
While this album perhaps ought to be classified with the classical releases, Ron Carter is known (unlike Wynton Marsalis, who had earned a reputation in classical music as well as jazz) primarily as a jazz artist. And "Ron Carter Meets Bach" is being issued by a jazz label, Blue Note. More importantly, wile the compositions here are performed as Bach wrote them, and not in an improvisational or jazzed-up vein, the fact remains that Carter brings a certain jazz sensibility to everything he plays. In short, as with Benny Goodman's classical recordings, this release is as likely to appeal to jazz fans familiar with Carter as it is to classical fans. It's also a very solid performance. Carter's selection of Bach's works includes works for flute, violin, clavichord and organ: so respectful of and attuned to Bach is Carter's playing you might think each piece had been written for the acoustic bass.